In both cases rehearsals were in the afternoon of the same day, starting at about 17.00 hrs. Although the bulk of the Orchestra is made by members who subscribe annually to it, non-members are VERY welcome. A number of members speak either English or German, so don't be shy !! 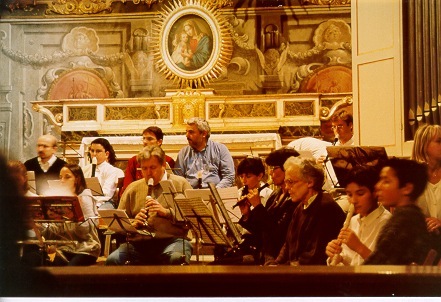 From Thursday 8 to Monday 12 April 2004 the second International Easter Course of Ensemble Recorder playing has been scheduled. Read for more information the announcement in English or in Italian. You can bring any size of recorder you would like to play. Players of all abilities/grades are equally acceptable. We use modern pitch ie A=440 Hz. Parts are supplied to all players, and the charge for non-members is € 20 per day. After the Concert we usually have a meal in some nice trattoria, (or Stube, as available...). I know it is rather unlikely that any of you may be around, but if you by any chance are somewhere near at these dates, please drop a line to my email, and then turn up for a warm welcome , lots of fun and some recorder-related Italian colour !!! 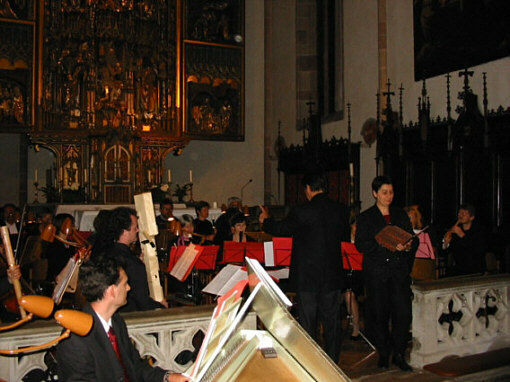 Concert of Saturday 17th May 2003 at the Chiesa Gotica di Lana (Bolzano), Italy. Report of the First International Meeting and Course of Recorder Ensemble Music in Lucca.